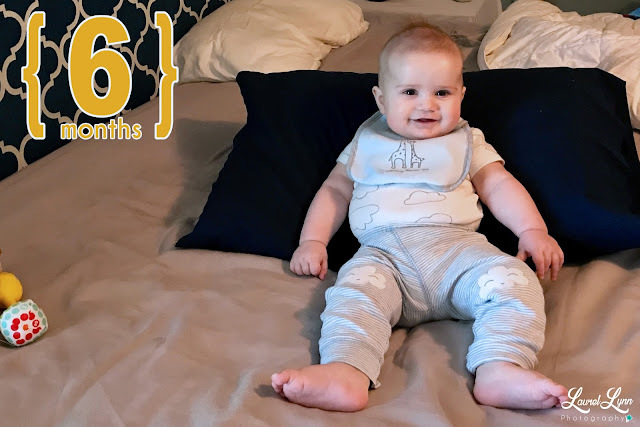 Just Another Day...: Squish is Six Months Old! Squish is Six Months Old! Y'all, please don't hate. I have FOUR kids. Count 'em! FOUR! This, apparently, lends itself to having Z-E-R-O free time nor any ability to manage time in general. Please note today is technically January 9th. Squish was officially 6 months old on December 13th. He will be 7 months in FOUR DAYS, PEOPLE. Four. Time is madness! Speaking of time... please take note of the horrible photo quality! It's an iPhone pic, guys. I didn't even have the time to take a REAL LIFE OFFICIAL HALF-YEAR PHOTO OF MY BABE! Let's just say our trip to Great Wolf Lodge the second week of December, paired with hosting a Christmas party, the little guy's 6-month well visit, my nephew's wedding, meeting with caterers (plus several dozen other tasks for a little gathering I'm throwing this Sunday), photography sessions, Christmas Eve, Christmas Day, and New Year's Eve, not to mention homeschool back in session from our holiday break... WHEW, Y'ALL! I mean, I know this is typically a busy time of the year, but WHOA! I'm surprised I've remembered to breathe this past month! So hopefully all of the aforementioned crazy will eventually excuse the "poor 4th child" syndrome my little Squish is apparently destined to develop, my extraordinary efforts notwithstanding. Our sweet little continues to be a ridiculously awesome babe! And he's getting SO big! At his 6-month well visit, which technically was 12/18/2017, he was a big ol' 17 lbs. 7 oz. (though he has since topped the 18 lbs. mark). Just take a look at those legs above! And that belly hanging over the waistband of his pants! I cannot even! This boy is still not a huge fan of tummy time, but he'll hang out for a few seconds before he rolls over onto his back. He has yet to roll from back to tummy (again, because of that love of tummy time LOL! ), and he isn't sitting up independently yet, either. Ask me if I care! Hahaha! With this fella being our final, I can't help but NOT be in any hurry whatsoever with his developmental milestones. Just what you wanna hear from a parent/homeschool teacher! Hahaha! He has started eating stage 1 baby foods, and is a big fan of pears, butternut squash, applesauce, and sweet potatoes. Basically anything that ISN'T green beans. Bless. He's also had some rice cereal, which he also enjoys. Boy likes to eat, y'all! 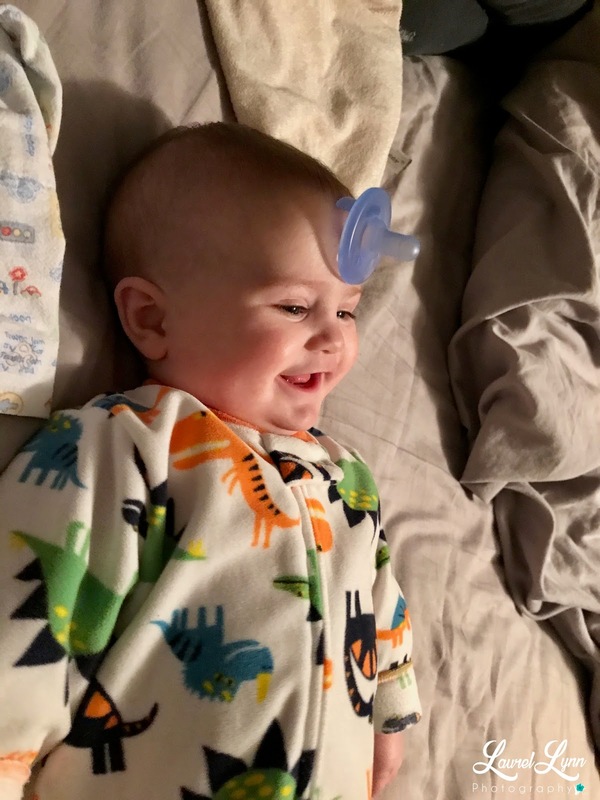 He's probably the most hilarious baby we've ever had. Seriously he keeps us laughing all.the.time! He's just so chill and thinks pretty much everything is funny. 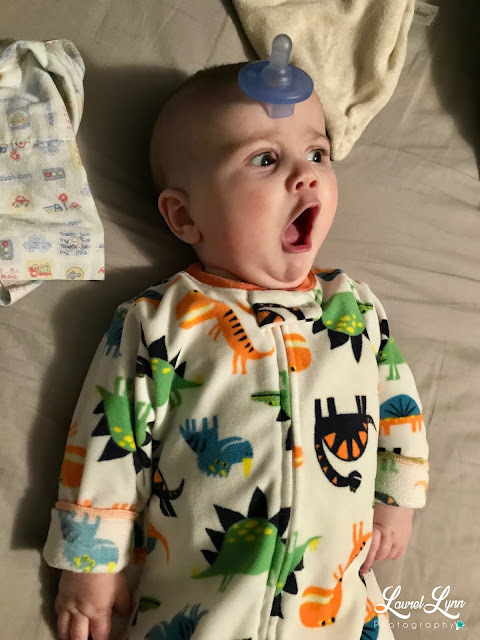 Balancing a paci on his forehead is one of his many impressive skills. See? THIS FACE. This is the one that I cannot get enough of! When he gets really excited and can barely contain himself?! This is what you get! HAHAHAHAHAHAHAHAHA!!! Squish is Seven Months Old!